Learn how to build a lean-to shed that is more solid than any prefab box. Gain a lot of storage space at an affordable cost. STEP-BY-STEP GUIDE HERE. Are they packed with tools, lawn and garden equipment, sports equipment, firewood, and out-of-season outdoor furniture? If miscellaneous mess is crowding you, your kids, pets, and cars out of your lawn and garage, you need a lean-to shed. This means that the structure leans against the house, garage, or even a fence for support, providing a weather-safe haven for your gear. Lean-to sheds are functional, inconspicuous, and at the same time can offer significant storage space. Pro Tip: Plan ahead – get the most out of your lean-to with a shelving system for sheds (click here to see the various types). Even better, the simple shape of this shed type means it can be made in a weekend by anyone with basic carpentry skills for minimum cost with the right plans. Our handy step-by-step guide will walk you through how to build a lean-to shed. Keep in mind right at the start of the project that you’ll need to check your local zoning and building codes. There may be exemptions for small sheds in some areas, but most likely any structure added to your house or garage will need a building permit before you can begin construction. Get to know your local building inspector – they are a valuable resource. Frequently, they carry simple handouts that provide requirements for various tasks and structures. And rope in a friend or family member if you can – the more the merrier, and it helps to have an extra set of hands to hold components in place while you work. You won’t need any special tools. Chances are you probably already own most of the basic carpentry tools you’ll need for this project. All of the materials are available at a home repair store. Here’s a great list showing example prices and specific brands and quantities. The whole project, in this case, cost about $800. However, you most likely also have some of the materials already in stock as well, so the cost for you will likely be lower. Pro Tip: Select the lumber with care for a professional result. Make sure to get lumber specifically designed for outdoor use. 1. Figure out your footprint. The first place to start is by determining the location and size of your shed. Look for a spot where there are no windows or doors in the way, like the side or back of a garage. Use the length of the support – whether the garage, side of your house, or part of a fence – to determine length. For example, you can take it the length of your garage and then figure for about an 8 foot width and 7 foot ceiling. Of course, these dimensions may be different based on your desired shed size and/or space to work with. Pro Tip: Make sure to remove any debris or vegetation within the shed’s footprint. The ideal site is flat, and slopes slightly away from the garage. Use string on pegs to mark out the shape of your shed. Measure carefully the distance between the supporting structure and the first outside corner. If the length of your addition will span the full length of your structure, you can simply pull the string across the side of the building. Then, dig your post holes – about 3 feet deep should do the trick. You can measure the distance between individual supporting poles, and mark it out along your string line so you know exactly where each one needs to go. Drop a few shovels full of ready mix concrete into each hole for the footings, then set a 4×4 post into it after the concrete hardens. After filling in the holes with dirt, be sure to square and level the posts in their holes. Next, bolt the 2X8 joist carrier onto the posts using the 4”x 5/16 lag screws. First, bolt 4 16ft long 2×6 stringers to the side of your structure. Use 6”x 5/16” lag screws recessed into the wood. You’ll use two to attach the roof joists, and the other two for the roof joist supports. The joist supports need to be attached about 2 feet apart. Try to attach your stringers at the posts that frame out your garage or supporting structure (similar to hanging a very heavy painting using a hook that’s nailed into a stud). If needed, you can also use large pieces of scrap 2x lumber to give the lag screws even more wood to bite into. Next, use nails and metal L-brackets to attach the 2×4 roof joists at 2 foot intervals on the wall side of the shed. Employ hurricane ties and nails to accomplish the same thing on the post side. Then, attach the 2×4 roof joist supports with nails and metal brackets between the lower stringer on the structure’s wall and the roof joists. To use your lumber efficiently, choose the length of your joist supports so you can get two supports out of one 8 ft. 2×4 board. Pro tip: Make sure you provide plenty of roof support if you live in a colder climate and anticipate having snow on the shed roof. Use 2×4 nailers in order to attach the roofing panels by nailing them onto the top of the roof joists; 2 feet apart should do it. Then add a few lengths of 3×3 angle edging to the end of roof joists to help protect from the weather. Finally, screw 11 galvanized steel 3×8 foot roofing panels to the 2×4 nailers with #10 1-1/2 inch External Hex Flange Hex-Head Wood Screws (with rubber washers). Cover the gable ends of the roof with metal roofing material. 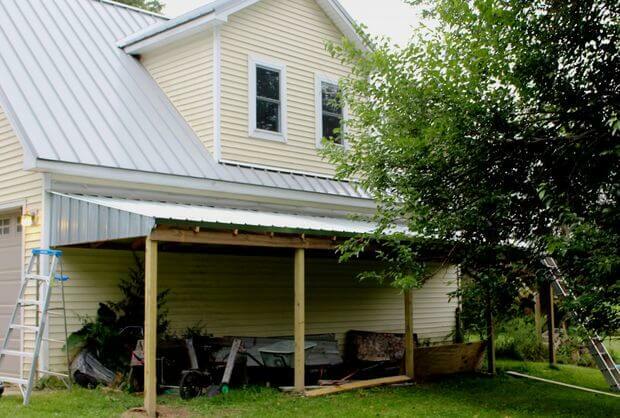 Be sure to add aluminum flashing between the structure/garage wall and the shed roof. Pro tip: If you need to cut corrugated metal roofing, using a hand-held grinder and metal cutting blade. Make sure to wear goggles and gloves. This tutorial, including images, is published with generous permission by jimmar57. If you want to spruce up and finish your lean-to shed, try sanding the entire surface to remove any rough edges, then use paint and primer intended for wood exterior surfaces or a stain. Now, keep in mind that there’s no strict requirement to build a shed against a wall, but it does provide greater strength and support and makes the project far easier. If you do choose to build a freestanding shed, you’ll need to add a conventional stud wall across the back and face it with plywood siding. Also, you may choose to build the shed on a concrete slab or pressure-treated skids and floor joists. This yields a more permanent structure, but will require more skill and effort. Remember that every area has unique climate and building requirements. Consider not just snow, but any high winds, heavy thunderstorms or earthquakes that may effect your area – you might need special metal framing anchors to tie it all together. A lean-to shed will give you a lot of storage space for minimal cost and effort, and is far more satisfying and solid than any pre-purchased box. You can keep the plan very basic, or add on more permanence with walls and flooring – or even just by using a tarp to cover the outside in winter. 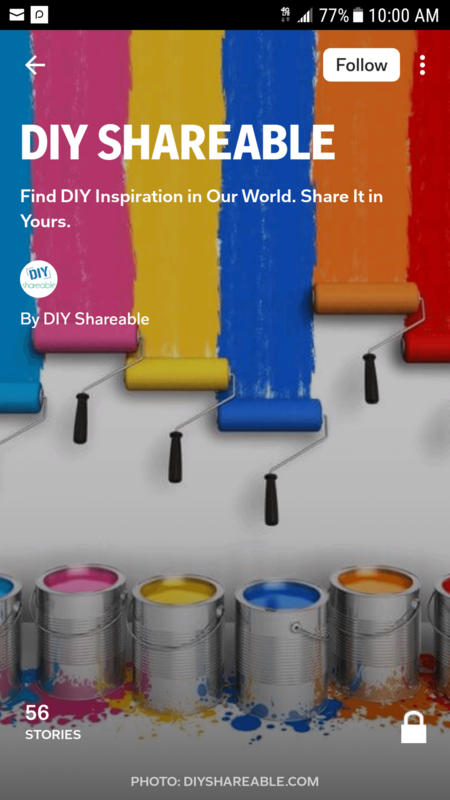 Let us know if this helped inspire or guide you and feel free to add it to the “honey-do” list or share with any fellow DIY-minded friends!